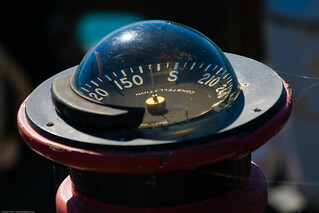 Compass on deck of derelict fishing ship at the North Coast Guard T-Pier in Morro Bay, CA 06 Nov. 2008. "Mike" L. Baird, Canon 1D Mark III, 100-400mm IS handheld. Thanks for the cool Creative Commons inclusion of my compass here!